Occasionally, some reference verses will be added in the left column for additional study. See parts 6 and 7 (the indexes), for a complete list of all the verses that might pertain to a specific time period. Further references and information on most Revelation verses should appear in part 4, "The Main Text." Consult the index, in part 7B, for their location. Rev 1:1. THE REVELATION OF JESUS CHRIST, WHICH GOD GAVE UNTO HIM, TO SHOW UNTO HIS SERVANTS THINGS WHICH MUST SHORTLY COME TO PASS; AND HE SENT AND SIGNIFIED IT (or made it known) BY (sending) HIS ANGEL UNTO HIS SERVANT JOHN. Ref Rev 22:16,6; Lk 12:37,43. Rev 1:1. THE REVELATION. Note, it is singular. This book does not contain different revelations, but one extensive revelation that makes known the subject of the entire book. OF JESUS CHRIST. The information that is to be given is of Jesus Christ, not of John. WHICH GOD GAVE UNTO HIM. The Father gave it to Jesus. TO SHOW UNTO HIS SERVANTS THINGS. One of the purposes of the Revelation is to show the servants of Jesus Christ certain things. The Revelation is not for unbelievers, but for those, who, when the Lord comes, shall be found watching and doing. WHICH MUST SHORTLY COME TO PASS. The Revelation gives future events that are absolutely certain to come to pass. Even as the Revelation was being written, some of the prophecies were already beginning to transpire. HIS ANGEL UNTO HIS SERVANT JOHN. The Father gave it to Jesus. Jesus delivered it to the angel. The angel revealed it to John, and John makes it known to the servants of God through the written Word. John is shown here as the writer of the Revelation. In Rev 22:16, it is written, I JESUS HAVE SENT MINE ANGEL TO TESTIFY UNTO YOU THESE THINGS IN THE CHURCHES. AND HE SAID UNTO ME, THESE SAYINGS ARE FAITHFUL AND TRUE: AND THE LORD GOD OF THE HOLY PROPHETS SENT HIS ANGEL TO SHOW UNTO HIS SERVANTS THE THINGS WHICH MUST SHORTLY BE DONE-Rev 22:6. Clearly, Jesus is showing that the Revelation is to be taught in the churches. These things, which must shortly come to pass, are to be taught to God’s servants. 1:2. WHO BARE RECORD (or testifies) OF THE WORD OF GOD, AND OF THE TESTIMONY OF JESUS CHRIST, AND OF ALL THINGS THAT HE SAW. Ref Jn 1:1,14. (C) AND OF ALL THINGS THAT HE SAW. John bears record of what he saw. These are the Word of God and the testimony of Jesus Christ. 1:3. BLESSED IS HE THAT READETH, AND THEY THAT HEAR THE WORDS OF THIS PROPHECY, AND KEEP (or take to heart, or obey) THOSE THINGS WHICH ARE WRITTEN THEREIN: FOR THE TIME IS AT HAND (or near). Ref Rev 22:7; Ja 1:22. THE TIME IS AT HAND (or near). In part 3A, it has been noted that the "last days, or last time, or last times" began when Jesus was manifested and extends up to and including the Millennium. When the Revelation was written, the "last" time was at hand; today it is still at hand. 1:4. JOHN TO THE SEVEN CHURCHES WHICH ARE IN (the province of) ASIA: GRACE BE UNTO YOU, AND PEACE, FROM HIM WHICH IS, AND WHICH WAS, AND WHICH IS TO COME; AND FROM THE SEVEN SPIRITS (or sevenfold Spirit-JNT118) WHICH ARE BEFORE HIS THRONE. Ref Isa 11:2; Rev 3:1; 4:5; 5:6-seven Spirits. WHICH IS, AND WHICH WAS, AND WHICH IS TO COME. This is the first Person of the Trinity. WHICH ARE BEFORE HIS THRONE. Here is the third Person of the Trinity. Note, the sevenfold Spirit is before "HIS THRONE." Note, "seven" represents "completeness." Some relate this to Isa 11:1,2. The candlestick or lampstand in the tabernacle was called the "menorah." It had one main stem in the middle and three branches on either side-ref Ex 25:31,32. This might be compared with Isa 11:2 and the sevenfold Spirit. 1:5. AND FROM JESUS CHRIST, WHO IS THE FAITHFUL WITNESS, AND THE FIRST BEGOTTEN (or firstborn) OF THE DEAD, AND THE PRINCE (or ruler) OF THE KINGS OF THE EARTH. UNTO HIM THAT LOVED US, AND WASHED (or freed) US FROM OUR SINS IN HIS OWN BLOOD. Ref Jn 15:13. US FROM OUR SINS IN HIS OWN BLOOD. As it is written, GREATER LOVE HATH NO MAN THAN THIS, THAT A MAN LAY DOWN HIS LIFE FOR HIS FRIENDS-Jn 15:13. It is by the blood of Jesus that we are washed from our sins. (Note part 4C, "The Sacrifices of Jesus.") In this verse, Jesus is first described as being faithful. He came to this earth and washed us from our sins in His own blood. He has risen from the dead and is called the Prince or Ruler of the kings of the earth. Through these, we see that Jesus is portrayed as a servant, a priest, the King, and the Saviour. 1:6. AND (He) HATH MADE US KINGS (or a kingdom) AND PRIESTS UNTO GOD AND HIS FATHER; TO HIM BE GLORY AND DOMINION (or power) FOR EVER AND EVER. AMEN. Ref Rev 5:10; 20:6. N, M, Rew, JHM. 1:7. BEHOLD, HE COMETH WITH CLOUDS; AND EVERY EYE SHALL SEE HIM, AND THEY ALSO WHICH PIERCED HIM: AND ALL KINDREDS (or tribes, or peoples) OF THE EARTH SHALL WAIL (or mourn) BECAUSE OF HIM. EVEN SO, AMEN. Ref Dan 7:13; Mt 24:29,30; Zech 12:10. A.
COMETH WITH CLOUDS. This is referring to the coming (or return) of Jesus Christ at the Battle of Armageddon, immediately after the Tribulation. AND EVERY EYE SHALL SEE HIM. All shall see the return of Jesus. AND THEY ALSO WHICH PIERCED HIM. Even those in hell shall see the return of Jesus. BECAUSE OF HIM, EVEN SO, AMEN. Zech 12:10 says, AND I WILL POUR OUT ON THE HOUSE OF DAVID AND THE INHABITANTS OF JERUSALEM 1) A SPIRIT OF GRACE AND SUPPLICATION. THEY WILL LOOK ON 2) ME, THE ONE THEY HAVE PIERCED, AND THEY WILL MOURN FOR HIM AS ONE MOURNS FOR AN ONLY CHILD, AND GRIEVE BITTERLY FOR HIM AS ONE GRIEVES FOR A FIRSTBORN SON-NIV. The return of Jesus, as the King of kings and Lord of lords, is the blessed hope for those that are watching and ready. He returns as the Judge. However, for those that chose to follow the Antichrist, it will be a time of utter terror. 1:8. I AM (the) ALPHA AND OMEGA, THE BEGINNING AND THE ENDING, SAITH THE LORD, WHICH IS, AND WHICH WAS, AND WHICH IS TO COME, THE ALMIGHTY. Ref Rev 4:8; 22:13. P, N, A, FE. 1:9. I JOHN, WHO ALSO AM YOUR BROTHER, AND COMPANION IN TRIBULATION (or in the suffering), AND IN THE KINGDOM AND PATIENCE OF JESUS CHRIST (or patient endurance that are ours in Jesus-NIV), WAS IN THE ISLE THAT IS CALLED PATMOS, FOR THE WORD OF GOD, AND FOR THE TESTIMONY OF JESUS CHRIST. 1:9. I JOHN. Again, for the third time, John is showing he is the writer of the Revelation. AND COMPANION IN TRIBULATION (or in the suffering). Christians will suffer. John was also suffering. The word "tribulation" used here refers to suffering, rather than "the Great Tribulation." AND IN THE KINGDOM. The kingdom may be talking about the millennial reign of Jesus Christ. FOR THE WORD OF GOD, AND FOR THE TESTIMONY OF JESUS CHRIST. (I had been exiled to the island called Patmos for having proclaimed the message of God and borne witness to Yeshua-JNT.119) John, an old man, had been banished to the island of Patmos as a prisoner, because of his faithfulness to the Word of God and testimony of Jesus Christ. Yet from this seemingly hopeless banishment, would come forth the final book of the Bible—the Revelation. In Jesus there is freedom and hope. Reportedly, after Emperor Domitian’s death, in approximately 96 A.D., John returned to Ephesus; he had been the pastor of the church there before his exile. It is to Ephesus that the first of his seven church messages was addressed. 1:10. I WAS IN THE SPIRIT ON THE LORD’S DAY, AND HEARD BEHIND ME A GREAT (or loud) VOICE, AS OF (or like) A TRUMPET. Ref Rev 1:15. 1:10. John was in the spirit on the Lord’s Day. Some believe this is referring to "Sunday." Others believe this means he was in the "Spirit," or carried ahead in time to the day that Jesus shall ultimately return—thus, the "Lord’s Day." There are other opinions, also. He heard a great or loud voice like a trumpet. 1:11. SAYING, I AM ALPHA AND OMEGA, THE FIRST AND THE LAST: AND, WHAT THOU SEEST, WRITE IN A BOOK, AND SEND IT UNTO THE SEVEN CHURCHES WHICH ARE IN ASIA; UNTO EPHESUS, AND UNTO SMYRNA, AND UNTO PERGAMOS, AND UNTO THYATIRA, AND UNTO SARDIS, AND UNTO PHILADELPHIA, AND UNTO LAODICEA. SEND IT UNTO THE SEVEN CHURCHES WHICH ARE IN ASIA, then they are named. The seven churches represent the entire church age from Pentecost until the Lord raptures the church, just prior to the Antichrist being revealed and the Tribulation beginning. John is told a total of twelve times in the Revelation to write. WRITE, THEREFORE, WHAT YOU HAVE SEEN-Rev 1:19 NIV; WRITE-Rev 2:1; WRITE-Rev 2:8; WRITE-Rev 2:12; WRITE-Rev 2:18; WRITE-Rev 3:1; WRITE-Rev 3:7; WRITE-Rev 3:14; WRITE-Rev 14:13; WRITE-Rev 19:9; WRITE-Rev 21:5. The term "seven churches" is used in Rev 1:4,11,20. 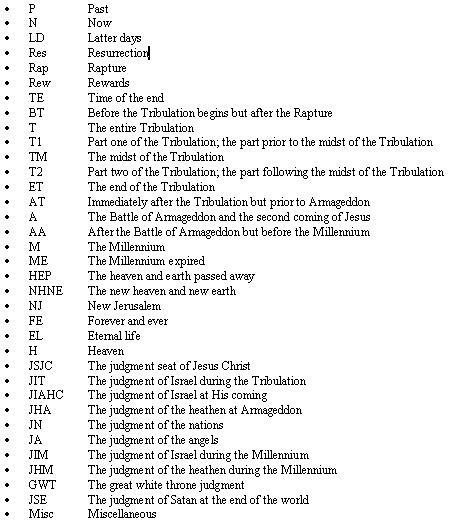 Revelation chapters 2 and 3 contain information on these seven churches. 1:12. AND I TURNED TO SEE THE VOICE THAT SPAKE WITH ME. AND BEING TURNED (or when I turned), I SAW SEVEN GOLDEN CANDLESTICKS (or lampstands). Ref Rev 1:20. SAW SEVEN GOLDEN CANDLESTICKS (or lampstands). Rev 1:20 says, THE SEVEN CANDLESTICKS...ARE THE SEVEN CHURCHES. The lampstand is used to support a lamp. Its wick is fueled with oil, which is often symbolic for the Holy Spirit. The seven golden lampstands or "light holders" represent the seven churches. Lampstands are needed during the night, not during the day. GOD IS LIGHT-1 Jn 1:5. Light is needed to illuminate a world in darkness. 1:13. AND IN THE MIDST OF THE SEVEN CANDLESTICKS (or lampstands) ONE LIKE UNTO THE SON OF MAN, CLOTHED WITH A GARMENT (or a robe) DOWN TO THE FOOT, AND GIRT ABOUT THE PAPS (or His chest) WITH A GOLDEN GIRDLE (or a gold band, or sash around His chest). Ref Dan 7:13; Isa 11:5; Eph 6:14. ONE LIKE UNTO THE SON OF MAN. Jesus is standing in the midst of the seven candlesticks or seven churches. From here through v.16, we are given eight descriptions of the glorified Jesus. John does not see Him as the One born in a manger or even as the One that walked about the land of Israel. John sees Jesus in all His heavenly splendor. WITH A GOLDEN GIRDLE (or a gold band, or sash around His chest). The gold may denote majesty or something "precious," the golden girdle, righteousness and truth. Since Jesus was taken up into heaven, He is the HIGH PRIEST, WHO IS SET ON THE RIGHT HAND OF THE THRONE OF THE MAJESTY IN THE HEAVENS-Heb 8:1. HE…MAKETH INTERCESSION FOR THE SAINTS-Ro 8:27. Some believe that the clothes are those of a king, priest, judge, and ruler; however, Jesus is not shown engaged in the work of the high priest in this passage. He does not have a mitre on His head, as it is written of the high priest, THOU SHALT PUT THE MITRE UPON HIS HEAD, AND PUT THE HOLY CROWN UPON THE MITRE-Ex 29:6; ref Lev 8:9; Zech 3:5. He is not shown to have on the kingly crown. Also He is not girded around His waist, but about the breasts with a golden girdle (or sash). This may indicate the position of "Judge." The high priest was girded about the waist or loins-ref Ex 28. The clothing may suggest that His high priest’s work is over. It may reflect Jesus after the Rapture has occurred. It may reflect Jesus as the "Judge" during the Tribulation, when His judgments come upon the earth in ever increasing devastation. Jesus is the One, Who opens the seven seal judgments, which are revealed shortly. During His actual return to the earth, Jesus is described differently. He has upon His head, MANY CROWNS-Rev 19:12; AND HE HATH ON HIS VESTURE AND ON HIS THIGH A NAME WRITTEN, KING OF KINGS, AND LORD OF LORDS-Rev 19:16. 1:14. HIS HEAD AND HIS HAIRS WERE WHITE LIKE WOOL, AS WHITE AS SNOW; AND HIS EYES WERE AS A FLAME (or blazing) OF FIRE. Ref Dan 7:9. 1:14. HIS HEAD AND HIS HAIRS WERE WHITE LIKE WOOL, AS WHITE AS SNOW. This does not mean like the hair of a decrepit old man. Rather it may refer to a patriarch: the father or ruler of a family, the highest dignitary, the head of a government. It can denote His wisdom. This identifies Him with the Father, the Ancient of Days in Dan 7:13. What is true of the Father is also true of the Son—both are Divine. OF FIRE, which may indicate seeing all and His judgment regarding sin. 1:15. AND HIS FEET LIKE UNTO FINE (or burnished) BRASS (or bronze), AS IF THEY BURNED IN A FURNACE; AND HIS VOICE AS THE SOUND OF MANY (or rushing) WATERS. Ref Rev 1:10. AS IF THEY BURNED IN A FURNACE. The WINEPRESS will be trodden WITHOUT THE CITY, when Jesus returns-Rev 14:20. It is the WINEPRESS OF THE WRATH OF GOD-Rev 14:19. WATERS. Verse 10 had said, His voice was a great voice as of a trumpet. 1:16. AND HE HAD IN HIS RIGHT HAND SEVEN STARS: AND OUT OF HIS MOUTH WENT A SHARP TWOEDGED SWORD: AND HIS COUN-TENANCE (or face) WAS AS THE SUN SHINETH IN HIS STRENGTH (or in all its brilliance). Ref Heb 4:12; 1 Jn 1:5; 2 Thes 2:8; Rev 19:15,21; 21:23. SEVEN STARS. Rev 1:20 says, THE SEVEN STARS ARE THE ANGELS (or messengers) OF THE SEVEN CHURCHES. Jesus holds the angels of the seven churches in His right hand. AND OUT OF HIS MOUTH WENT A SHARP TWOEDGED SWORD. Out of the mouth of Jesus went the Word. The sharp two-edged sword represents God’s Word-ref Heb 4:12; Rev 19:15,21. WAS AS THE SUN SHINETH IN HIS STRENGTH (or in all its brilliance). This is confirmed in various ways in other scriptures; as it is written, GOD IS LIGHT-1 Jn 1:5. The Antichrist shall be destroyed WITH THE BRIGHTNESS OF HIS COMING-2 Thes 2:8. In New Jerusalem, THE GLORY OF GOD DID LIGHTEN IT, AND THE LAMB IS THE LIGHT-Rev 21:23. On the Mount of Transfiguration, the face of Jesus did SHINE AS THE SUN, AND HIS RAIMENT WAS WHITE AS THE LIGHT-Mt 17:2. Note the words, THE "SUN" OF RIGHTEOUSNESS-Mal 4:2. FEAR NOT. Jesus reassures John and comforts him with these words. Then Jesus continues showing Who He is. I AM THE FIRST AND THE LAST. This was also used in Rev 1:11. 1:18. I AM HE THAT LIVETH, AND WAS DEAD; AND, BEHOLD, I AM ALIVE FOR EVERMORE, AMEN; AND HAVE (or I hold) THE KEYS OF HELL AND OF DEATH. Ref Rev 20:6. 1:18. #14-Jesus said, I AM HE THAT LIVETH. This is the fourteenth description of what Jesus is. Jesus is alive. #15-AND WAS DEAD. Jesus died on the cross. #16-I AM ALIVE FOR EVERMORE, AMEN. Jesus rose from the dead. Jesus is alive for evermore and shall never see death again. Jesus, the Lamb of God, is clearly identifying Himself as the same Jesus that walked on this earth. This is the same Jesus that died a horrible death at Calvary, but rose from the dead. This is the same Jesus that now sits on the right hand of God the Father. THE KEYS OF HELL AND OF DEATH. Only Christ has these keys. Keys can represent authority. Only through Jesus is there life. Those that reject the life that Jesus offers them will perish. When a person’s physical body dies, who is not "in" Christ, they perish to a place called hell. Ultimately, they will be delivered up to the great white throne for the final judgment and then cast into the eternal lake of fire, which is the second death. Jesus has the "KEYS OF HELL AND OF DEATH." Those that are part of the first resurrection, on them the second death has no power-ref Rev 20:6. 1:19. WRITE THE THINGS WHICH THOU HAST SEEN, AND THE THINGS WHICH ARE (now), AND THE THINGS WHICH SHALL BE (or will take place) HEREAFTER (or after these). (A) THOU HAST SEEN. Again, for the second time, John is being told to write what he has seen. (B) AND THE THINGS WHICH ARE (now). He is being told to write the things which are now. HEREAFTER. He is being told to write the things that shall take place hereafter. This gives a good overview of the Revelation. It consists of things in the past, things that are happening now, and many things that will happen in the future. Some consider this a key verse in showing the outline of the Revelation. It covers what John has already seen, what is present (such as the seven churches) and then, what shall be "after" the seven churches. 1:20. THE MYSTERY (or secret) OF THE SEVEN STARS WHICH THOU SAWEST IN MY RIGHT HAND, AND THE SEVEN GOLDEN CANDLESTICKS (or lampstands, or menorahs) (is this). THE SEVEN STARS ARE THE ANGELS OF THE SEVEN CHURCHES: AND THE SEVEN CANDLESTICKS (or lampstands, or menorahs) WHICH THOU SAWEST ARE THE SEVEN CHURCHES. Ref Rev 1:12,13; 2:1. 1:20. THE MYSTERY (or secret) or perhaps things that are not understood by unbelievers, but are now revealed to the believers. OF THE SEVEN STARS, which are mentioned in Rev 1:16; 2:1; 3:1; another seven stars are mentioned in Amos 5:8. WHICH THOU SAWEST IN MY RIGHT HAND, AND THE SEVEN GOLDEN CANDLESTICKS (or lampstands, or menorahs), which are mentioned in Rev 1:12,13; 2:1. THE SEVEN STARS ARE THE ANGELS OF THE SEVEN CHURCHES. Many believe the seven angels of the seven churches are exactly what is written, seven angels-ref Heb 1:14. Each of the seven churches has an angel or messenger overseeing it. This author takes this position. Some others may relate the seven angels as follows. As stars shine at night, so the Christian is to let his light so shine. Thus, the stars (or angels) could represent the light-bearing Christians of the seven churches. There are other opinions, such as the seven angels represent the pastors of the local churches. WHICH THOU SAWEST ARE THE SEVEN CHURCHES. As previously noted, Jesus is shown in the midst of the seven churches, represented by the seven golden candlesticks. There are also the seven angels of the seven churches. From this, we can see how the Bible uses certain symbols. For example, the lampstands represent churches, and the stars signify angels.